Welcome! It is far too early to start training, its just a baby so your first priority is to get to know the bird and her you. For now just offer treats, talk softly. Stay calm around her and leave her cage open (if safe to do so with her leg) so she can come out and explore her surroundings. Let her approach you, take things at the birds pace. That would be my advice. Put her perch up to face level and try not to put your hands in her cage. Welcome, Ece and baby gray (what's his/her name?). You have a VERY young baby in your hands. In the wild, it would not have come out of the nest yet so you need to supplement her food with handfeeding as well as offer two different kinds of soft food served warm and fresh twice a day. Please make sure she is kept in a safe environment (perches low to the bottom of the cage, something soft on the bottom in case she/he falls, safe bar separation so he/she doesn't get a foot or head stuck in between them, etc) and don't even think of training until she is a juvenile because, even though it will work right now, it will backfire on you if you do it. Baby parrots are like human babies, all they need is warmth (make sure he/she is kept VERY warm), softness, good nutritional food and lots and lots of love - human babies don't go to school and baby parrots don't get training until they are older. Has he/she had an ionized calcium test to determine if his/her calcium levels are normal? Because the fact that he/she had a broken leg in the nest worries me as this is usually caused by a calcium deficiency. I have so much trouble trying to remember where the humans are from. I have been begging for the members to put their location in the info box to the left. It is a strain on my little old brain. Congrats on your African Grey! I don't know when to start training. 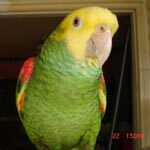 I have a 1.5 yr old Green Cheek Pineapple Conure. Have a Solomon Island Eclectus and a Quaker. I will tell you about an awesome book I highly suggest you read. It is called Alex & Me by Dr. Irene Pepperberg. She is a scientist who studied Greys and Alex was her star pupil. This book was on the New York Time's best seller list. Her research and teaching Alex along with him having taught her is nothing short of amazing. Alex was so well known that when he died, the Today show mourned him, newspapers and magazines were full of talking about him. Please read. I am sure you will enjoy.